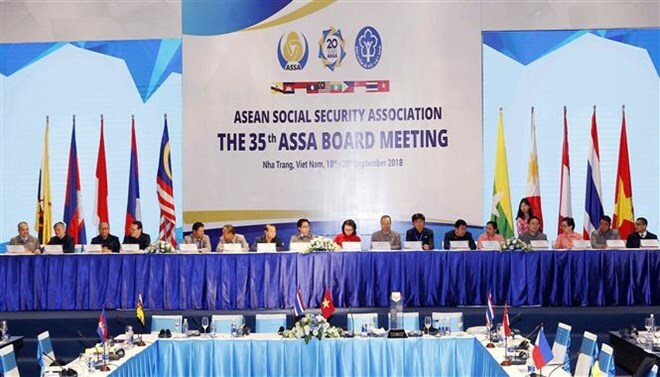 The 35th ASEAN Social Security Association (ASSA) Board Meeting wrapped up on September 19, after two days of working, in Nha Trang city, in the central province of Khanh Hoa. ASSA members, for the first time, adopted a joint statement manifesting the association’s common viewpoints and perceptions, with a unanimous agreement on the objective and orientation for social security cooperation in the region. The document affirmed the association’s commitment to fostering a united social security community on the basis of consensus that would develop in the best interests of the people, as well as for stability and development in the region. This will be the orientation of ASSA activities in the coming time and is in line with the ASEAN Community Vision 2025 which was signed at the 27th ASSA Summit in Kuala Lumpur, Indonesia in 2015. At the press conference after the meeting, Nguyen Thi Minh, President of ASSA for the 2018-2019 term, said that in order to realise the joint statement, the ASSA will continue to strengthen internal connectivity towards a prosperous, civilised, and developed ASEAN. 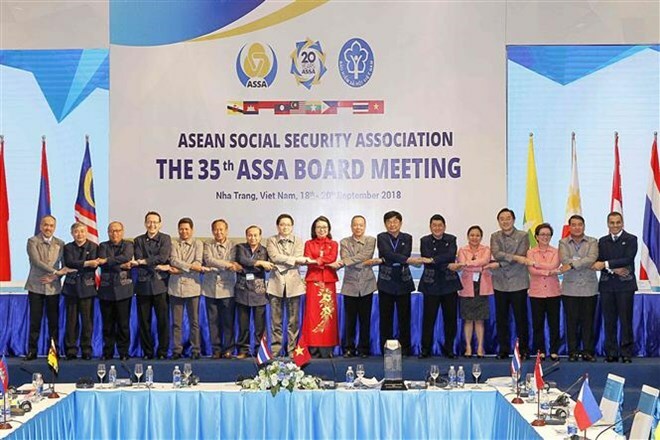 The ASSA will work out an action plan suitable for the association’s orientation and relevant to each member state, especially in the context of the FourthIndustrial Revolution and the free flow of labour, said Minh, who is also Deputy Minister and Director General of the Vietnam Social Security (VSS). 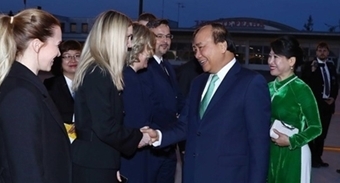 In answer to the Vietnam News Agency’s question regarding improving the efficiency of experience sharing among ASSA members amidst the differences in social security systems, ASSA Secretary General Dao Viet Anh said that while the differences are challenges, they also create opportunities for ASSA members to cooperate for mutual development. Over the past 20 years, ASSA members have well implemented the association’s common principle for the sake of people, Anh noted, adding that despite the differences, cooperation among ASSA members has been effective. “What the VSS has achieved is the sector’s efforts and is the result of experience sharing with regional countries,” said Anh, who is also Deputy Director General of the VSS. Suradej Waleeittikul, ASSA President for the 2017-2018 term, said that ASSA 35 received the valuable cooperation from the VSS. He said he hopes that ASSA will make a lot of progress and receive the full support of the Vietnamese member. “We will have more members and providedecent jobs for our citizens,” he added. Regarding the ASSA’s international cooperation activities in the future, Nguyen Tien Thanh, head of the VSS International Cooperation Department, said the expansion of cooperation with other international social security organisations was also one of the five initiatives affirmed at the VSS’recently finished meeting and was welcomed by ASSA members. “ASSA Secretariat will work out a detailed plan to implement the initiative towards building a modern and sustainable social security system,” he said. The ASSA was found in 1998 following the signing of a Memorandum of Agreement in Bangkok, Thailand on February 13 that year, involving heads of social security institutions from five countries - the Philippines, Indonesia, Malaysia, Singapore and Thailand. Representatives from Laos and Vietnam also attended the signing ceremony as observers. Later the year, the VSS became a member of ASSA. The association was formed to promote the development of social security in the region in consonance with the aspirations, laws and regulations of the member countries, promote regional cooperation in all areas of social security and exchange experience and information on social security. It works in cooperation with other social security institutions in the region and East Asia, and with similar or related organisations of social security in any part of the world. It cooperates in the protection, promotion and development of social security schemes through training, seminars, consultations and dialogues, among others. ASSA members now comprise 19 social security institutions from ten ASEAN nations.